Use characteristics of the boring machine_Industry knowledge_Xinxiang Lantu Machinery Co., Ltd. The portable boring machine is mainly used for machining small holes and concentric spacers. It is mainly used for construction machinery such as excavators, cranes and various cranes. At present, a variety of different types of boring machines have been developed and manufactured, with advanced structure and stable performance, which fully meet the pupil requirements of various industries. The application range of the boring machine is the machining and repairing effect of the rotary hole, the hinge hole and the shaft pin hole on the mechanical component. The whole machine parts of the boring machine are modular in design, which can be quickly installed and disassembled on site, which improves the efficiency of the installation. The boring machine can realize horizontal mounting boring, vertical mounting boring and hole milling on both sides of the hole. Various forms of boring machine support fixtures meet the actual needs in different working environments. The boring machine has high processing precision and the surface roughness can reach a high level. The engineering machinery boring machine is mainly used for on-site processing equipment for on-site maintenance of engineering machinery. It is mainly used for processing and repairing small and medium-sized pipes and their shaft pin holes. It is an indispensable tool in the engineering machinery maintenance industry, and is widely used. It is used for the specific processing and repair of holes in excavators, loaders, crawler cranes and large marine cranes. The new mobile boring machine adopts aluminum alloy frame, the quality is relatively light, the main rotation and its feed are driven by two motors respectively, which can realize stepless speed regulation, and the performance is quite superior and the stability is good. . The design of the boring machine is completely from the on-site maintenance. 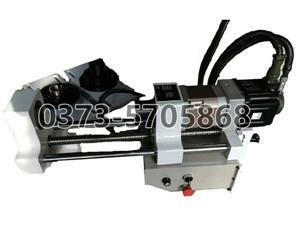 The operation of the whole machine can be completed by one person, which greatly improves the work efficiency. The boring machine is convenient and light, and is a good assistant for the construction site. The above is the use characteristics of the boring machine, I hope to help everyone.